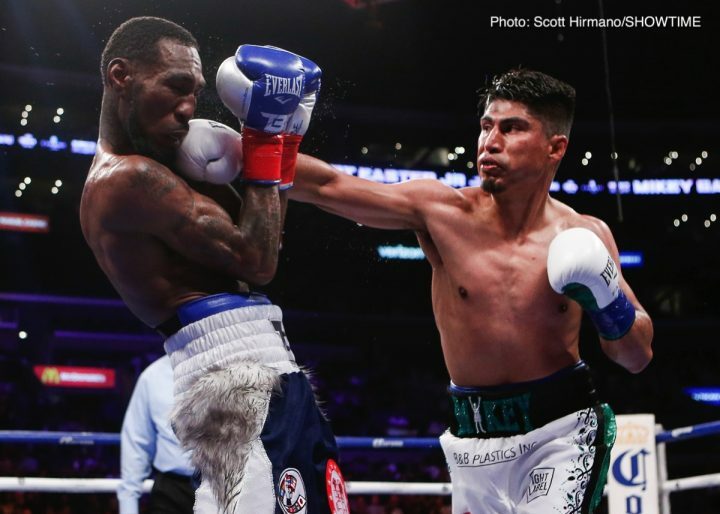 By Dan Ambrose: Mikey Garcia says he would KO both Manny Pacquiao and Vasyl Lomachenko if he were to face either of them. Mikey has shown the kind of punching power in the past that would give Pacquiao and Lomachenko problems. Pacquiao (60-7-2, 39 KOs) looked dangerous in his last fight in stopping Lucas Matthysse in the 7th round to win World Boxing Association ‘regular’ welterweight title on July 15. Mikey would have to stay out of the way of Pacquiao’s new-found punching power. Lately, Mikey has been talking about wanting to challenge IBF welterweight champion Errol Spence Jr. later this year. However, the Spence-Garcia fight is now being talked about taking place potentially in 2019. Mikey is in negotiations with Matchroom Boxing USA promoter Eddie Hearn, who doesn’t like the idea of him facing Spence right now. Hearn doesn’t see the Garcia vs. Spence fight being a big pay-per-view fight yet. He wants the fight to take place at a later point. If Hearn is able to sign Mikey, he’s going to be featuring him on his DAZN card. Mikey says Pacquiao isn’t a priority for him at this point in his career, but he wanted to face him a couple of years ago. Lomachenko is a fighter that Mikey has interest in fighting, but that match-up will be difficult to put together due to the Ukrainian being promoted by Top Rank. Lomachenko, 30, would be a tough opponent for Mikey to try and knockout due to his defensive skills, and his high work rate. Jorge Linares was able to knock Lomachenko (11-1, 9 KOs) down in the 6th round kn their fight last May. Lomachenko suffered a shoulder injury during the fight, but he was still able to stop Linares with a body shot in the 10th round. It was not an easy fight for Lomachenko. He looked human for only the second time in his pro career. Lomachenko had been beaten by Orlando Salido in 2014. Mikey easily beat Salido in 2013. Mikey’s punching power has suddenly abandoned him in his last three fights against Adrien Broner, Sergey Lipinets and Robert Easter Jr. Mikey wasn’t able to hurt Easter Jr. in their recent fight on July 28. Mikey still won the fight by a one-sided 12 round and looked good, but he was unable to stun Easter enough to put him away. More importantly, Mikey was hit a lot in the fight.